South Korea’s leading automaker Hyundai Motor Group said Wednesday it has formed a strategic partnership with Germany’s Audi of Volkswagen Group, in a bid to boost an emerging market for fuel cell electric vehicles worldwide. The two announced a multiyear patent cross-licensing agreement, covering a broad range of FCEVs components and technologies, with an ultimate goal of developing FCEVs together, according to the announcement. The partnership between the first producer of hydrogen-powered vehicles and the influential player in the auto market is expected to impact the paradigm for the global automobile market, taking a leap from electric vehicles to hydrogen-powered ones. While Hyundai Motor is the world’s first to mass produce ix35 Fuel Cell in 2013 the NEXO this year, with around 200 FCEVs running on fuel cells in the Korean streets, Volkswagen Group, where Audi belongs, owns around 10 auto brands and sells more than 10 million vehicles around the world each year. The German group is the No. 1 in the Chinese market. 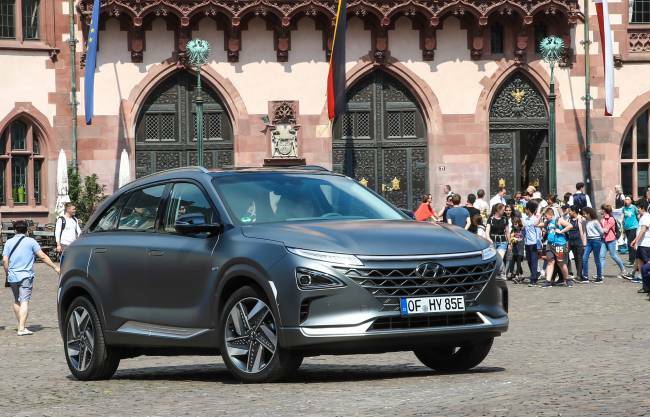 The German automaker seems to be seeking cooperation with Hyundai to take advantage of its leading fuel cell technology as part of switching its focus of next-generation cars from diesel-based vehicles to FCEVs. The latest agreement between Hyundai and Audi includes mutual access to fuel cell components. As the first step, Hyundai Motor Group will grant its counterpart access to parts that are based on Hyundai’s know-how accumulated from the development of the ix35 Fuel Cell as well as NEXO since 1993. Not only the patent sharing, but also developing FCEVs and spurring technological innovation for sustainable growth of the automotive industry will be key parts of the bilateral agreement. Audi introduced its hydrogen-powered concept car “h-Tron Quattro” at a motor show last year, and has a plan to launch an FCEV in 2020. The cross-license agreement will also give their affiliates equal opportunities to share patent licenses in the years to come, although the duration of the agreement has not been disclosed. Hyundai Mobis, the leading FCEV components manufacturer of the Korean auto group, is expected to expand its role for developing and supplying proprietary core components for Hyundai and Kia FCEVs. Mobis was the first company in the world to establish an integrated production system for core components of FCEVs last year, with a production capacity of 3,000 powertrain fuel cell complete modules per year.